Hey readers! Ok, I’m gonna stop calling y’all readers and start calling y’all friends because y’all are! You’ve been with me for a couple of months now, so I feel the love and hope y’all feel it too! I have arrived at my final destination! Peach City! I pulled up to my temporary digs 8 days ago now. Needless to say, the last few days have been hectic, hence why I have not been posting. I spent my last night on the road in the Queen City with an old friend from my prep days at an all-girls’ school. I have to admit, I was really surprised she let me stay with her. I hadn’t talked to her since she and her mom moved down south in the 10th grade. But I needed a place to stay and thought I’d just throw it out there. It is such a blessing to have good friends like that! Knowing that if you’re in need, they will help you. I have (or as I should say, HAD) friends who I would always go out with. They were always ready to go have a drink or go to the club. But if I got a flat or needed a sandwich because I hadn’t eaten in a week, they were nowhere to be found. Well, FRIENDS I’m still unpacking and learning my way around the area. I will be sure to keep you updated about my adventures in my new city. Until next time! Good morning readers! I arrived safely in the Queen City last night. Of course, with my luck it wasn’t without incident. Somewhere in Virginia (don’t ask me where, because I have NO idea! ), I got stuck in a major backup. 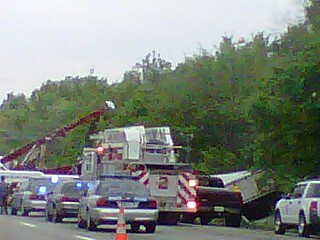 I did see the highway signs flashing for a while along 95 warning me “Accident at Exit 54.” My GPS was of no assistance. So, for about an hour, I sat in the bottleneck. Only one lane out of 3 was open to cars. A state trooper whizzes by me in the breakdown lane. Then I smell something burning. A few minutes later, a fire truck comes roaring by. Followed by a tow truck and some odd looking vehicle. Finally, I approached this scene, and this is what I saw: a tractor-trailer turned on it’s side. But I do have to thank God that I was just driving by and not the one involved in that accident. Hitting the road in a few more hours. Then, just about 3 1/2 hours until I get to the Peach City!